Trouble keeping your weight down? You’re not alone. The average American is overweight due to any combination of life factors: stress, convenience, laziness, poverty, among countless others. If you fall into the overweight category or would just like to lose those last five pounds, the answer may not be a gym membership or a visit to a nutritionist; your house may be making you fat! Sounds sensationalist? The first place many professionals start is at home. For many, making simple changes can make an enormous difference in their weight and their overall well-being; if change doesn’t have a significant impact, it’s often a great starting point for those who would like to lose weight. Studies have shown that people with messy, cluttered homes are 77% more likely to be obese or overweight than their neatnik counterparts. Peter Walsh, in his book Lose the Clutter, Lose the Weight, believes in a simple philosophy: tame your home, tame your mind, tame your body. When you get rid of the excess stuff in your home, your excess weight follows naturally. No, it’s not quackery. When you’re so overwhelmed by the mess, you can’t figure out where to start and give up before you even try, leaving you with an unfulfilled chore to tackle. However, when you accomplish and motivate yourself to take on a task, then focus on it, your overall motivation – and self-control – increases too. When the fridge and pantry are neat, there’s more room for you to store healthy foods accessibly. Get the cookies off of the counter – your kitchen will look neater and the temptation will be hidden. When you dump your “fat clothes,” you lose your fallback option. Plus, when you get busy with and focused on the task of decluttering, you have less time to sit around and overeat! Along similar lines, a clean home is a calming, discipline-inducing place. 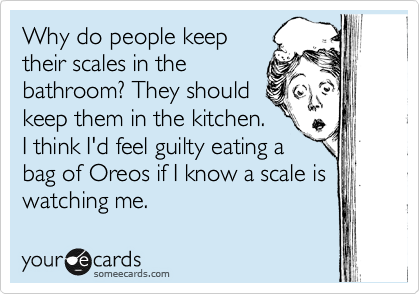 And, of course, cleaning – especially deep cleaning – is a great calorie burner. Even basic sweeping, mopping, dusting and vacuuming can be considered activity; vigorous cleaning is a fabulous fat-zapper. So clean those windows, wash those walls – and lose a couple of pounds while you’re at it! Go blue. Blue food is rarely found in nature and the color is naturally repulsive to us in terms of food. Serve on blue plates or blue placemats, swap the bulbs for a blue-toned light, or even paint the walls blue. Avoid warmer reds, oranges, and yellows as those are appetite stimulants. Shrink the serveware. Put your food on smaller plates and drinks in smaller cups to make smaller portions look bigger and more substantial. Get out of the kitchen. If you’re hanging out or working in the kitchen, you’re most likely snacking mindlessly. Stay out of food areas when it’s not time to eat, cook, or wash the dishes. If that exercise bike is in the garage or your weights tucked in a closet, you’re less likely to use them. Put the equipment in plain sight so that you’ll remember to use it; park the treadmill in front of the TV, keep your yoga mat next to the couch, and you will probably find yourself doing downward dogs or bicep curls during commercials rather than reaching for the Oreos. …duh. But you don’t need special equipment or a home gym – climb your stairs multiple times a day and forget about that Stairmaster. Jog in the back yard. Organize the garage and do the heavy lifting. Get creative – you’re sure to find some way to get in a workout in your very own home! Turn down the temperature! 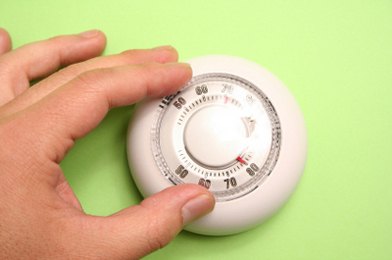 Keeping the thermostat lower makes your body work harder to keep warm, burning brown fat for warmth. If you don’t think you can adjust to a drastic temperature change, try turning it down one degree at a time. Sleep deprivation or low-quality sleep is directly associated with weight gain. Even if you can’t get in more hours, make your bedroom a more sleep-friendly place – make it a no-screens zone, spray jasmine, get a better pillow. So if you’re still working on your resolution from New Years… it’s not too late! Hi I’m after a link to the actual study that found people were 77% more likely to be overweight if they live in clutter? I can’t seem to be able to find the actual study, just people mentioning it. If you could email me that would be really appreciated, thanks! Hi Stefania, reports of that study trace back to Peter Walsh’s book Lose the Clutter, Lose the Weight. You can contact him via his site to find the original source. Good luck!